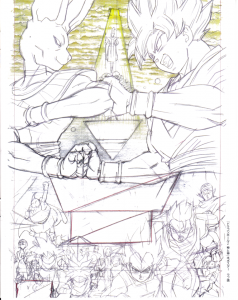 This is the original sketch by Dragon Ball manga artists Tadayoshi Yamamuro. This poster is still probably the most recognised image from Battle of Gods as it was the first picture released of Birusu and Goku from the new movie. Tadayoshi Yamamuro was responsible for a lot of the modern Dragon Ball Z characters as he was annimation director on the later Anime including GT and several of the games. The pictures comes from the April edition of DVD & BluRay Vision.